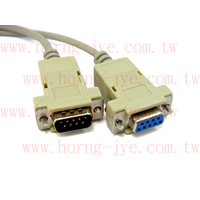 RS232 CABLE DB9M / 9F(ARA091+ARA092) - Horng Jye Technology Co., Ltd.
* Tinned or bare stranded copper conductor. * Rated temperature:80°C.Rated voltage:300 volts. * Passes UL VW-1 vertical flame test.